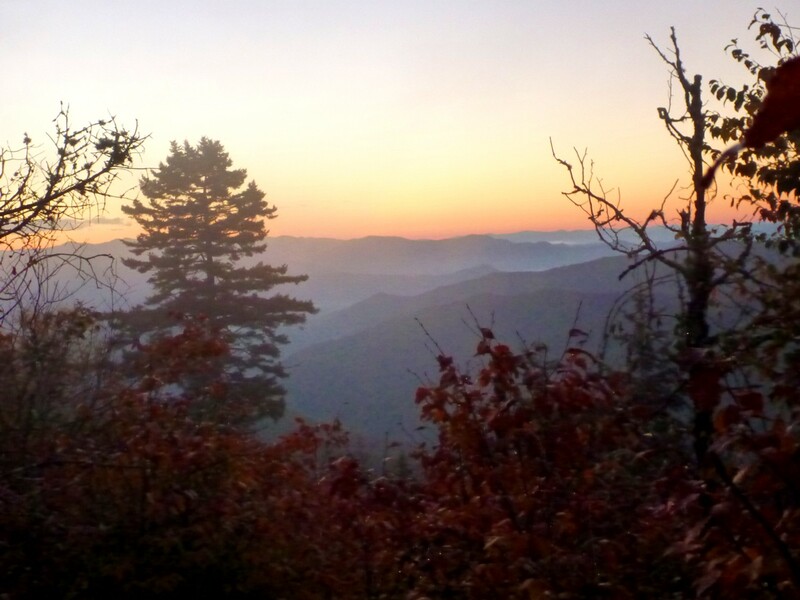 Posted by Jenny in conservation, hiking, Nantahala National Forest, Wilderness Society. View northwest from Boteler Peak. 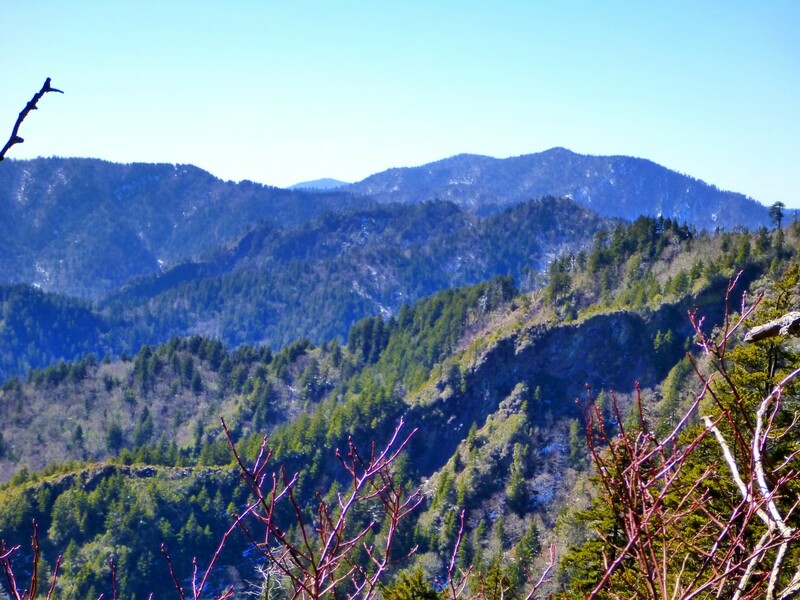 This post is one of a series about “North Carolina’s Mountain Treasures,” lands targeted for higher protective designation by the Wilderness Society. For more information about this campaign, please visit the Mountain Treasures website. 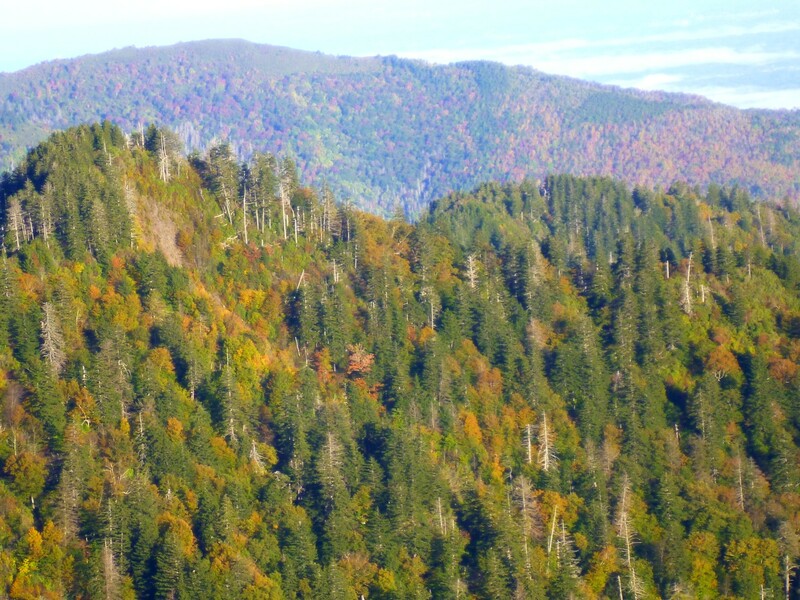 The review of management plans for Pisgah and Nantahala National Forests is now underway. Boteler Peak (elev. 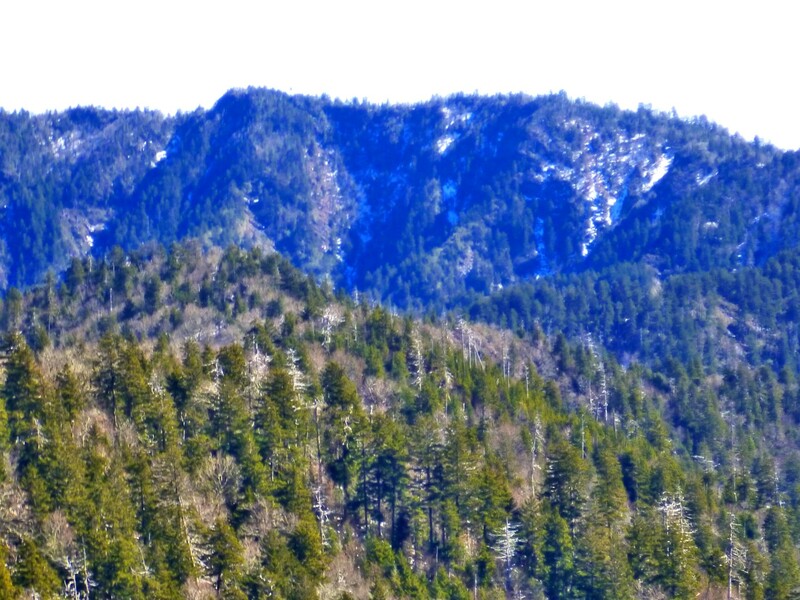 5010′) links the Tusquitee Bald/Fires Creek Rim area with the southern Nantahala mountains. 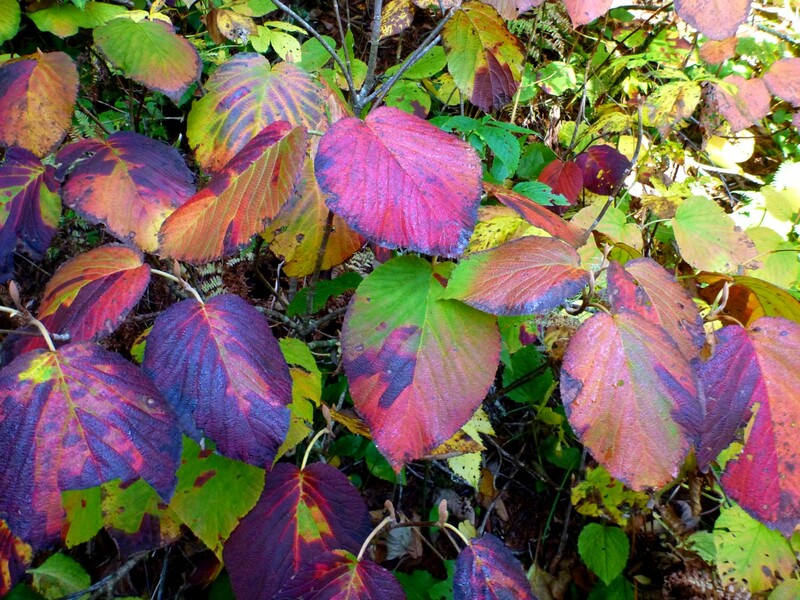 The area contains significant old-growth acreage, although big portions of the lower elevations have been logged. 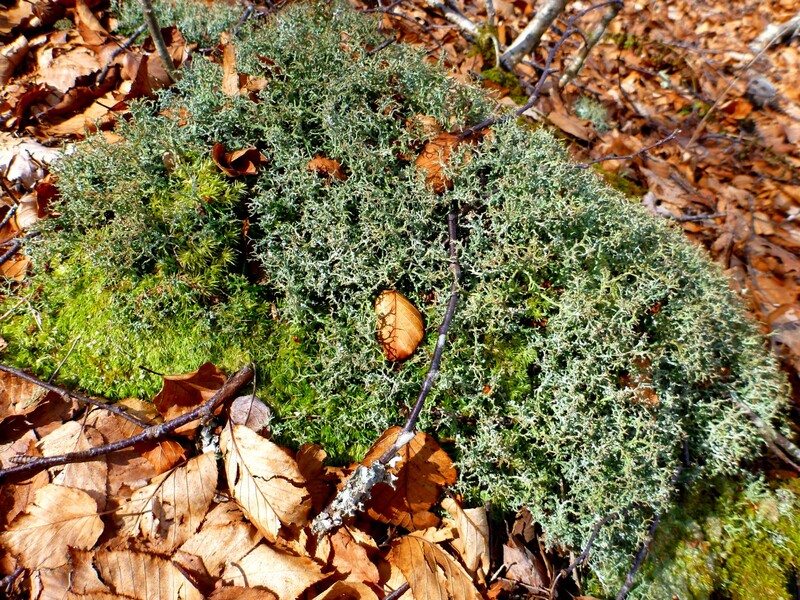 It is known for outcrops of serpentine rocks and unusual combinations of plants in what are called the serpentine barrens. 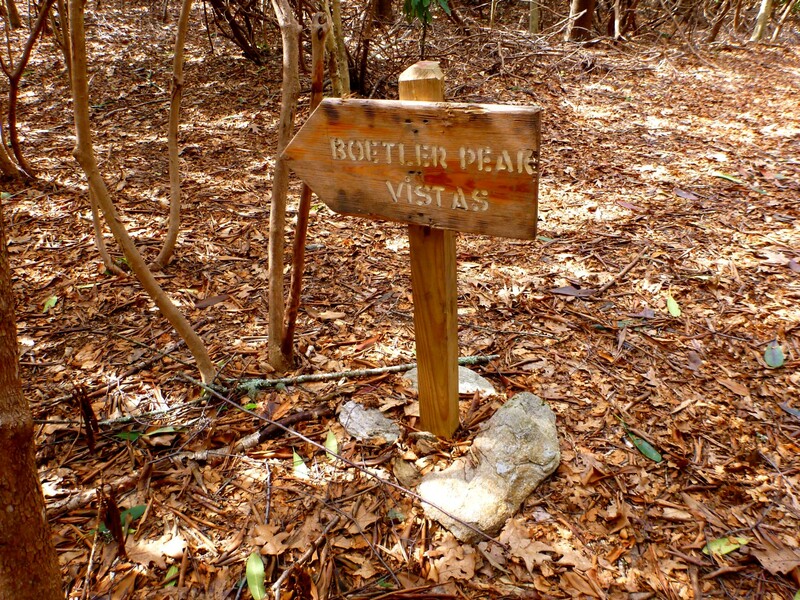 Boteler is reached via the portion of the Chunky Gal trail that goes northwest from Glade Gap on US 64. When I set off to visit Boteler yesterday, the toughest challenge I met was finding the trailhead. 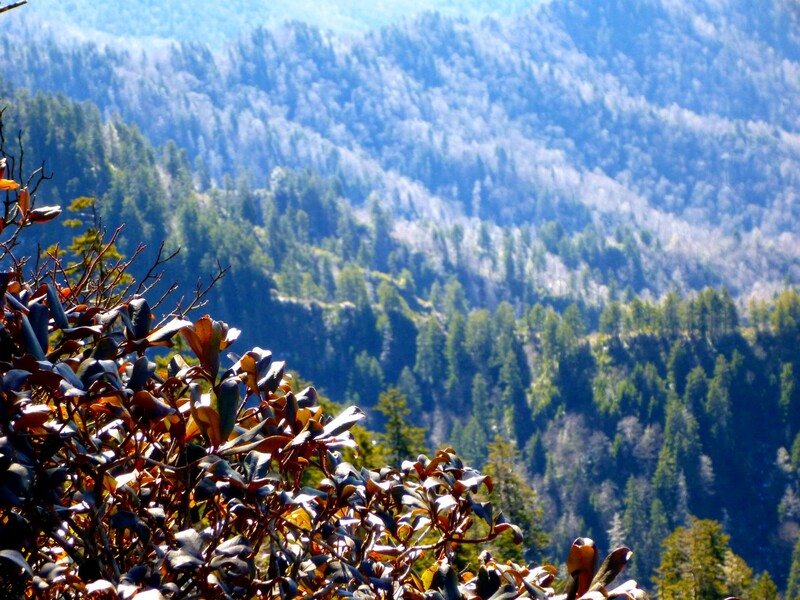 If you are driving from Franklin NC, you’ll find it several miles west of the Macon – Clay county line. 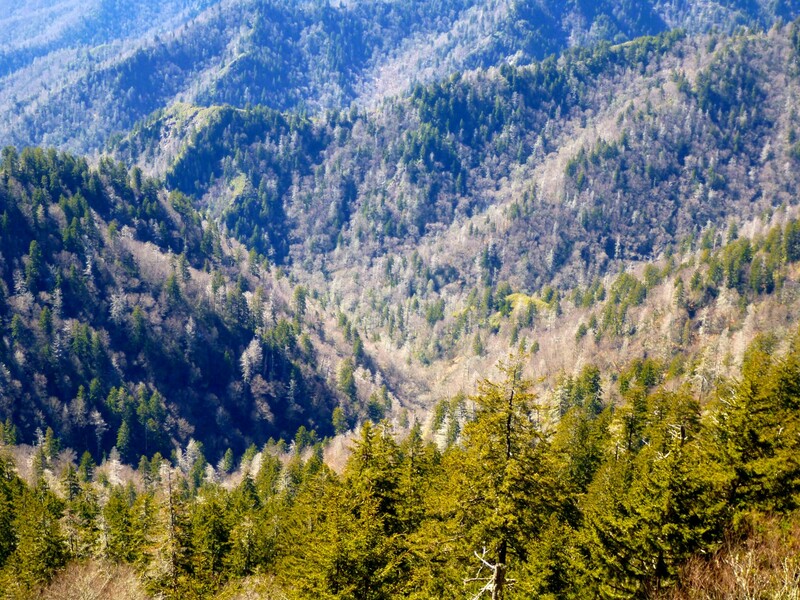 The best tactic is to look out for the top of a sustained climb, where you find a side road on the right marked “Old Hwy 64” just before the main highway drops down toward Hayesville. That is where you pull off. It is hard to spot the Forest Service marker from the highway. 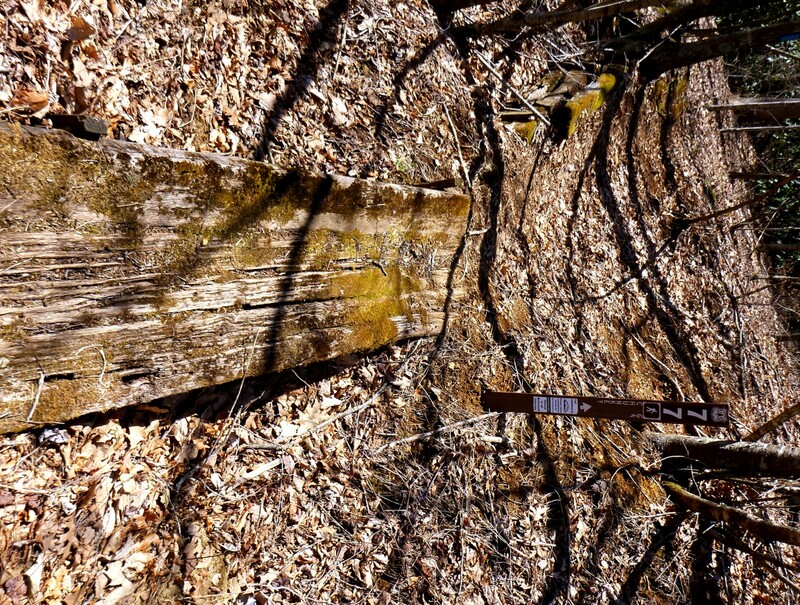 This is the second marker, tucked into the woods. After a false start on a gravel road just down the highway, I figured things out and set off along the dirt road where the trail starts. 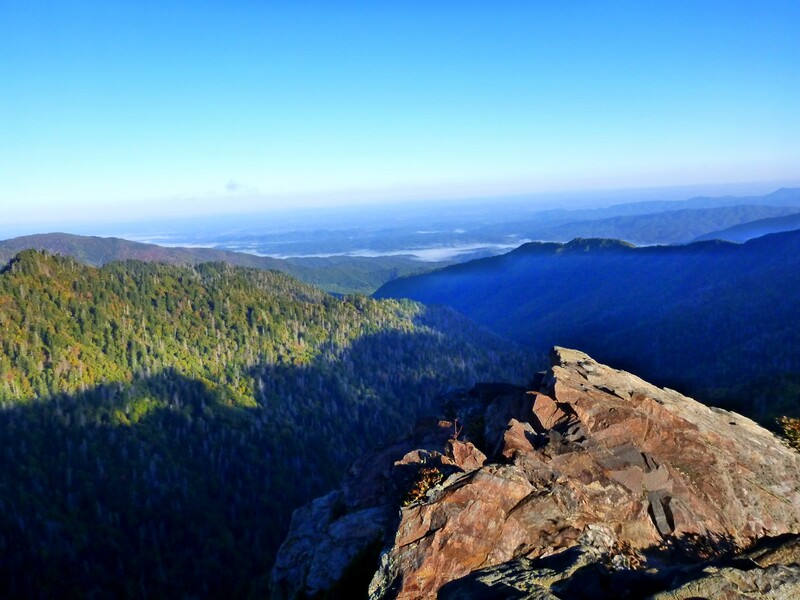 Following blue blazes, I dropped down into the valley of Glade Creek and started to climb along the stream. Total elevation gain was 1500′, and distance was about 6 miles roundtrip. 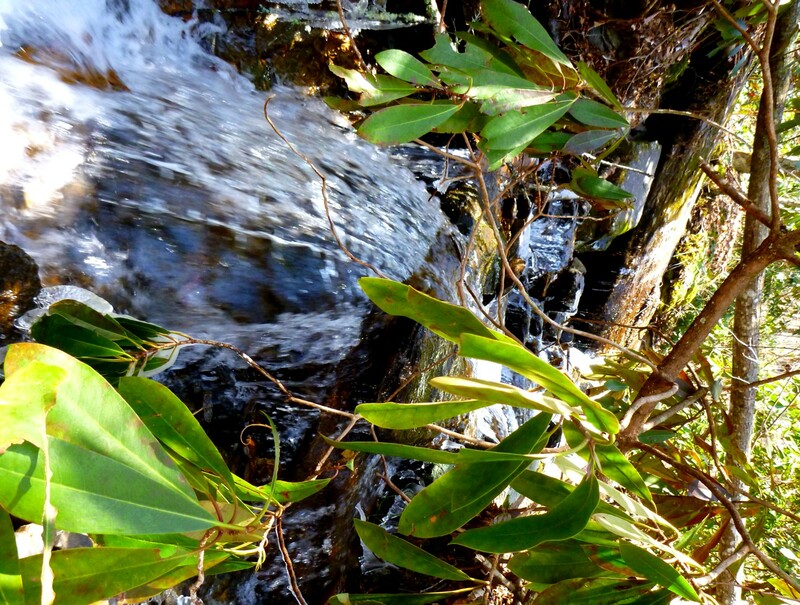 I crossed the stream at a pretty spot where rhodo overhung a small cascade. The night before, temps got down into the teens at this elevation, and ice was hanging on even though it was now in the low 40s. 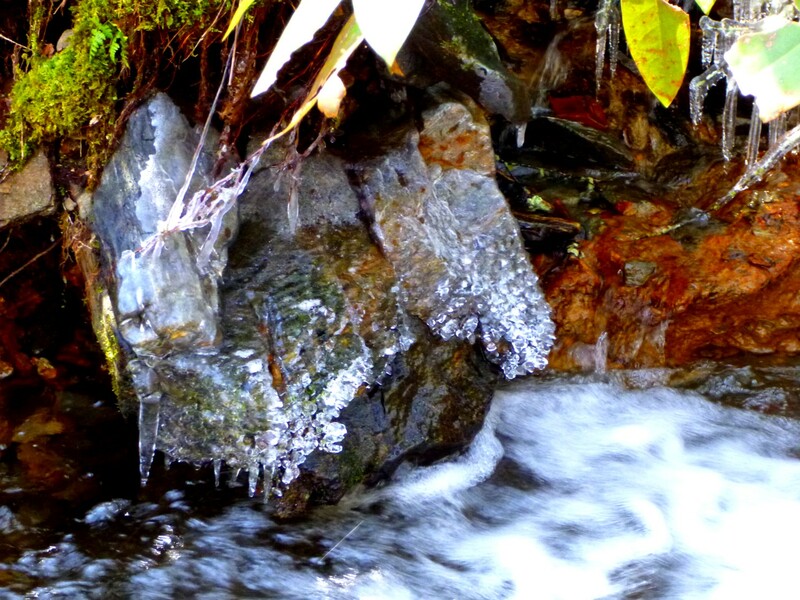 I liked this ice formation. I figured it was too early for spring wildflowers above 3600′. 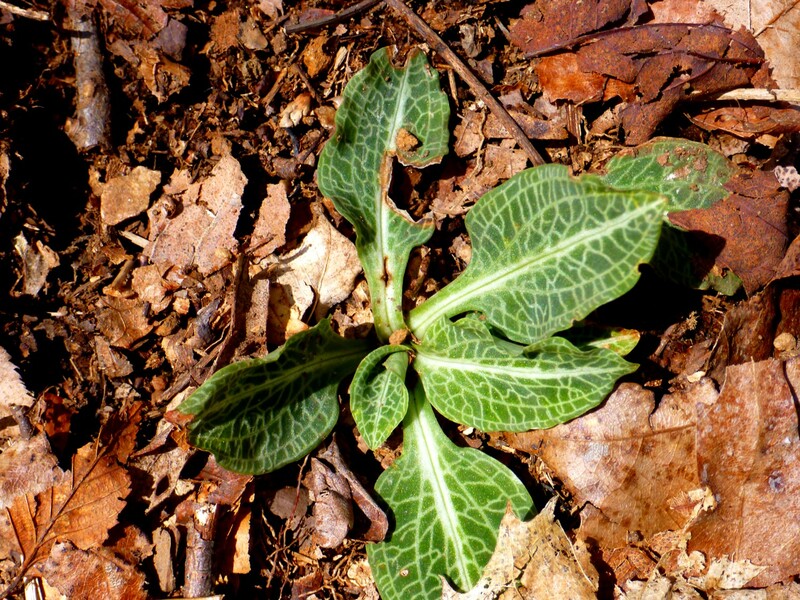 (I spotted my first trout lilies of the year the other day at 3000′ in the Plotts.) So I looked for other forms of interest. 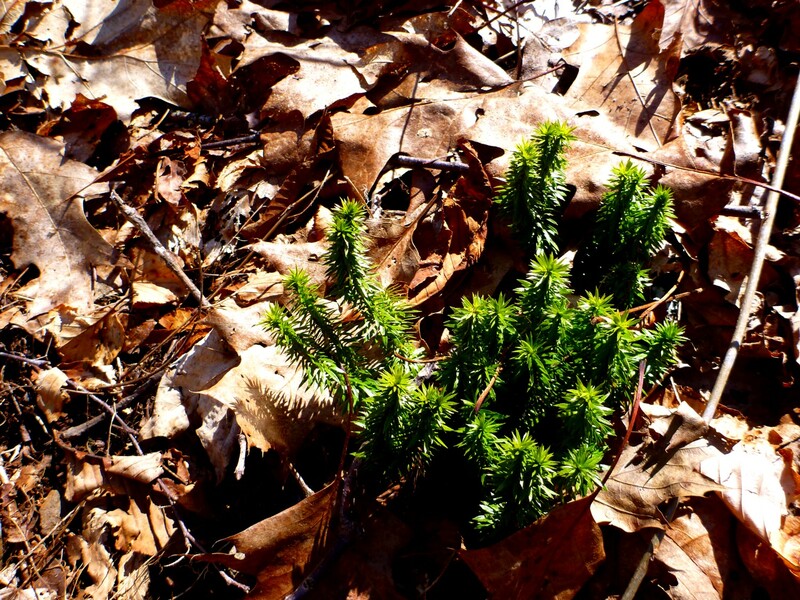 This club moss provided a luxuriant shade of green. A squirrel could take a shortcut underneath. 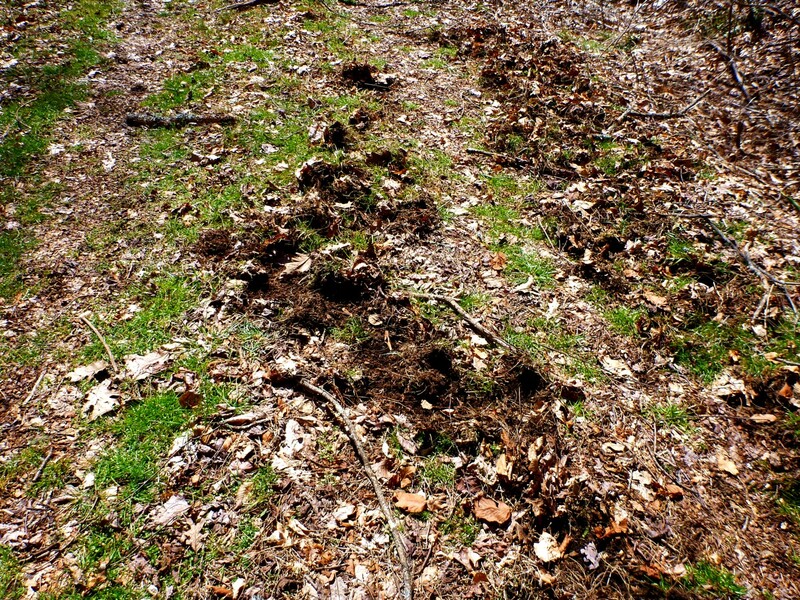 I’d heard that wild hogs are common in the area, and I saw their hoofprints and signs of rooting in several places. Earth rooted up by hogs. 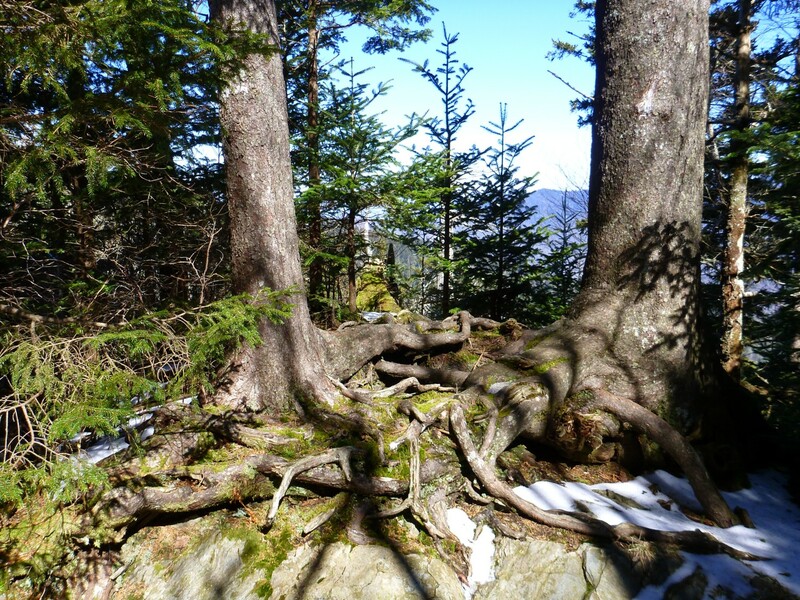 At the point where the trail left the road again to climb along the ridge, I saw something that really startled me: balsams. I would never expect to see them as low as 4500′, nearly down at the Georgia line. Planted by stealth? Escapees from a Fraser fir plantation? Beats me. They stood innocently along the edge of the road. Yes, they really were balsams. A few more spindly ones appeared on the other side of the trail, and then they disappeared, replaced by the occasional unhealthy hemlock that one would expect. I passed a few more interesting specimens of plant life. 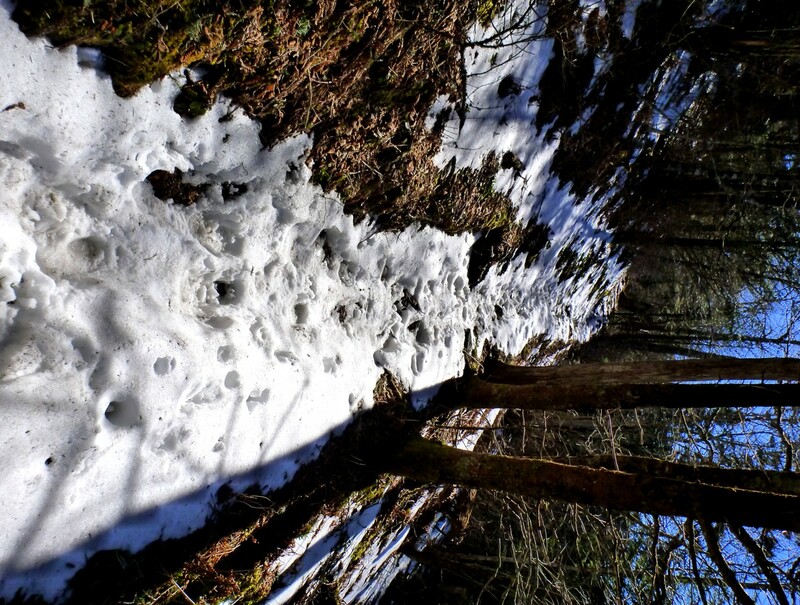 The trail stayed almost level for a while as it followed the ridge. 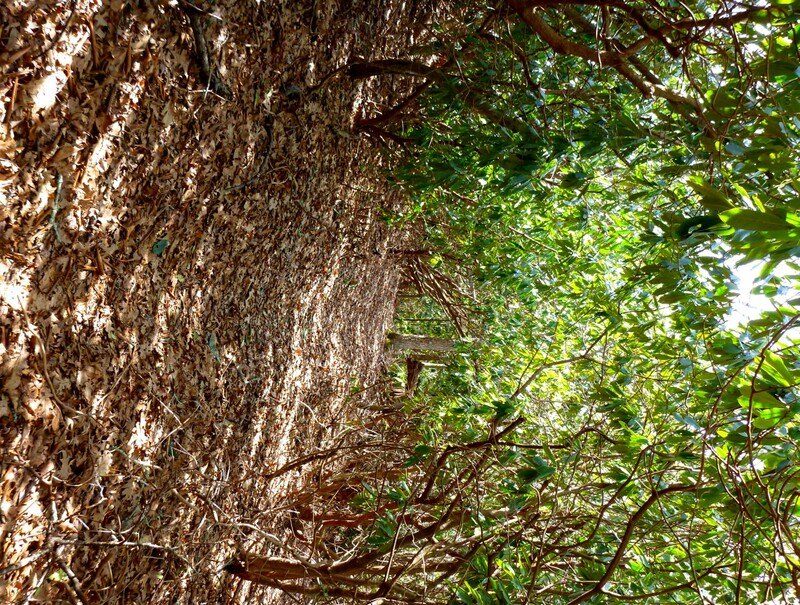 It went through a series of rhodo tunnels. I will have to come back in June. As I climbed slightly higher, I entered a zone affected by wind and fog. 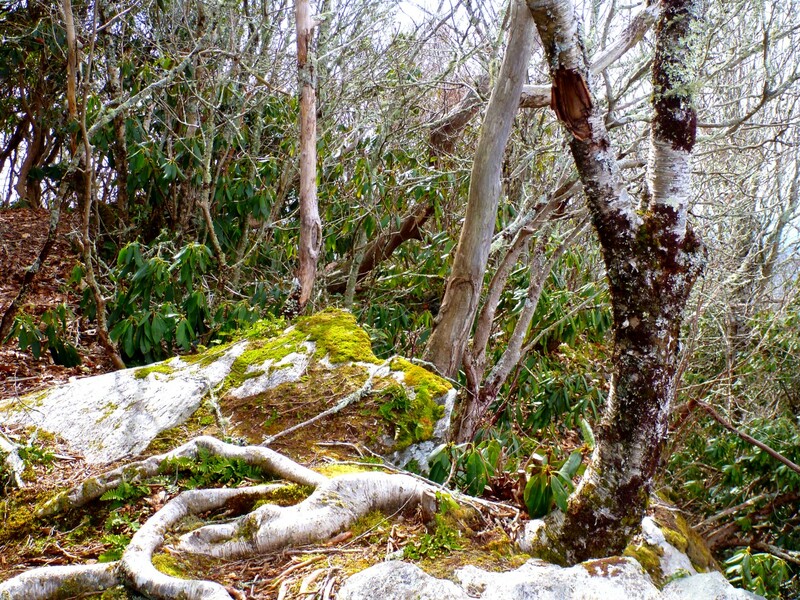 Twisted oaks rose above the rhodo understory, their branches covered with the lichens and moss caused by long immersion in mist. 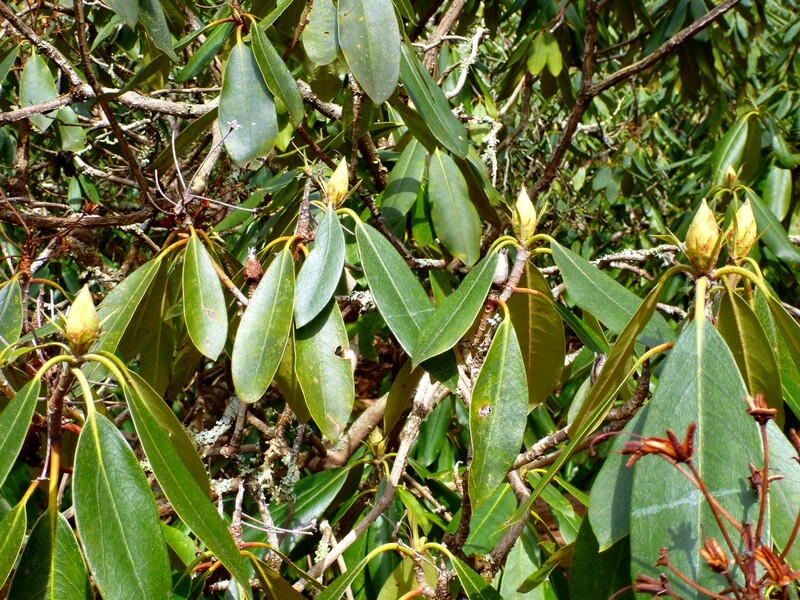 Areas of severe wind damage had been tended to by the Mountain High Hikers: I saw stacks of rhodo blowdown laid neatly beside the trail. 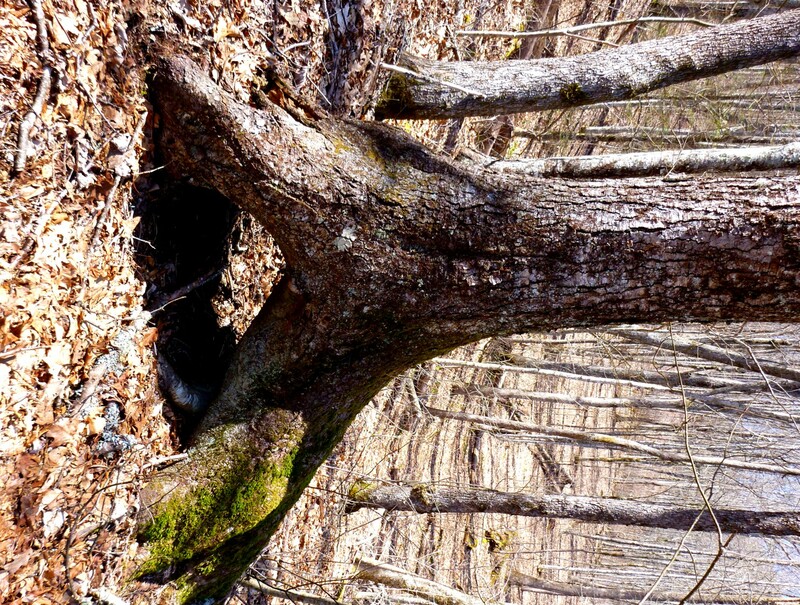 I passed a tree that had become a real mecca for woodpeckers. After following the ridge without much change in elevation for quite a while, I passed what I thought might be the high point and dropped down. I’d heard of a side trail to a view, so I kept going. Apparently this side trail has been improved by the Mountain High Hikers in the past couple of years. Boteler or Boetler? It’s anyone’s guess. From that point I climbed another 150′, to what was the true high point, before I reached the dramatic viewpoint among yellow birches and low, huddled vegetation—perhaps the serpentine barrens? 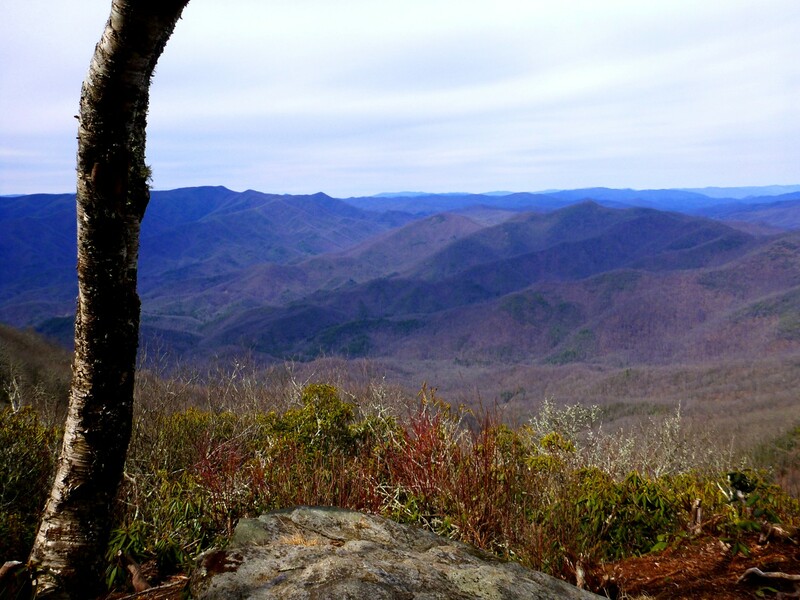 The best view was across to the Tusquitee range. 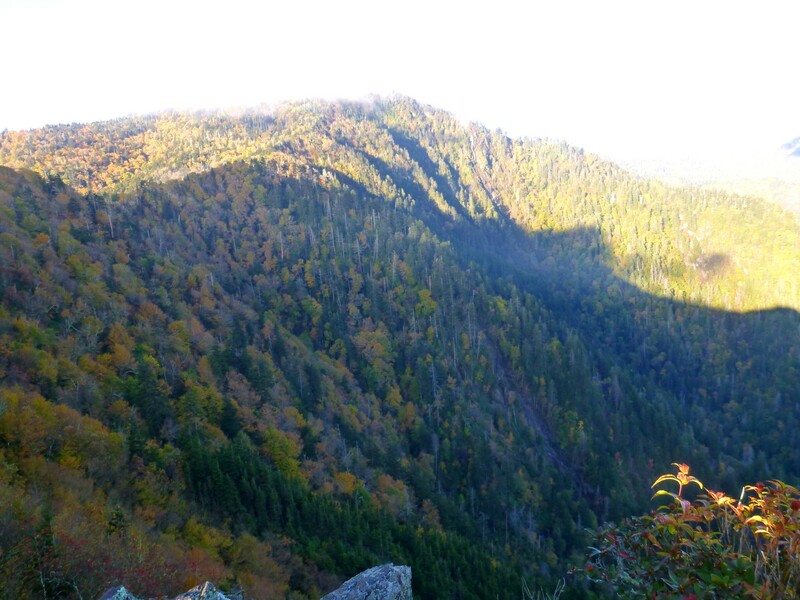 We could be looking at Potrock Bald and Tusquitee Bald. Correct me if I’m wrong. I liked the wind-stunted birches, but it was surprisingly chilly up there. I had two layers of fleece under my shell, plus my mittens. The sky had turned overcast. I could swear it was completely clear until I approached the summit and then cleared up again as soon as I left. Yellow birches clung to the boulders. 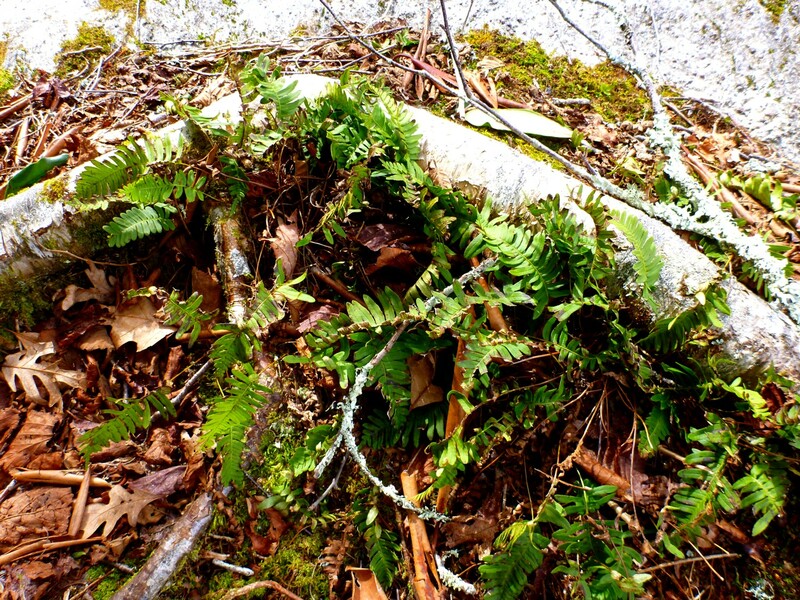 Polypody ferns embraced by birch root. 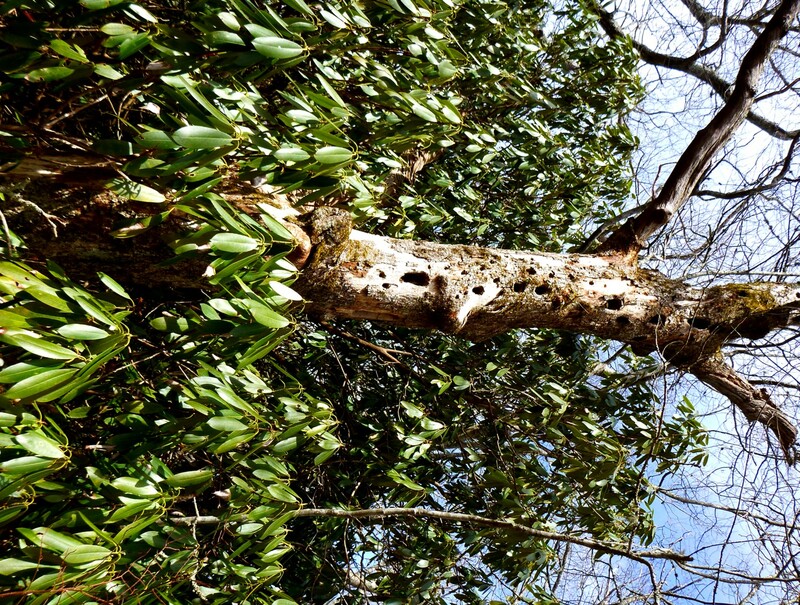 As I headed back down the side trail, I noticed an ancient laurel. Its trunk was massive. 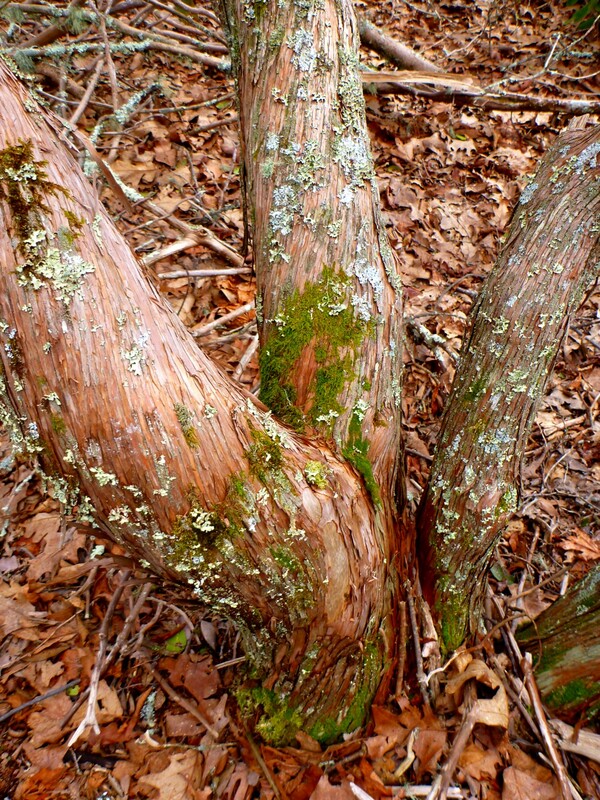 The texture of the bark was beautiful. 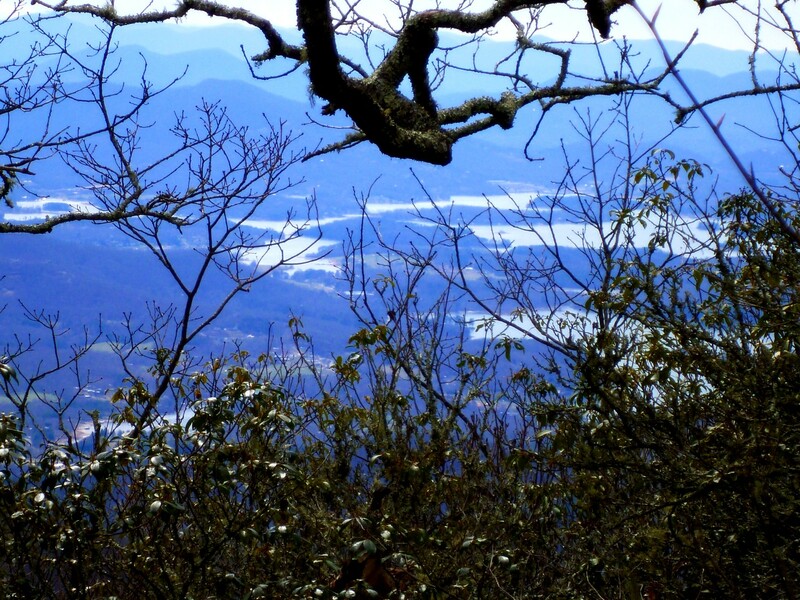 I had glimpses of Chatuge Lake to the south (see photo at bottom). The trip back to the trailhead went uneventfully. As I reached my car, another car pulled up and a man with a map stepped out. “Can you tell us where to find the Chunky Gal trail?” I pointed to the obscure Forest Service marker just a few yards away. 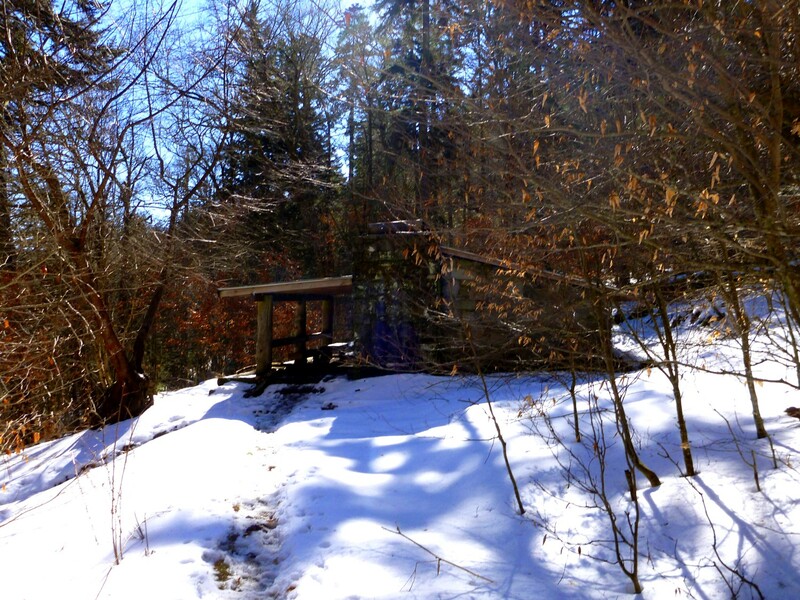 It turned out he had a house near Tusquitee Bald and was scouting out the trailhead location for a weekend hike. I gave him some information about my trip to Boteler, and he thanked me profusely. I got in my car and headed home toward Sylva. As I neared the A.T. crossing, I sped past three hitchhikers with large packs. I thought, “I can’t fit them into my small car!” and drove by. But a minute later I was turning around to pick them up. We’d figure out a way to squeeze everyone in. Sure enough, they were thru-hikers, and they’d had a tough day. Their water had frozen solid the previous night, and they’d gone quite a few miles without anything to drink. It had been a chilly day. They were headed into Franklin for some R&R and a “zero” day (a rest day with zero mileage). I was happy to take them to the place they planned to spend the night in downtown Franklin. “You made our day!” they said. No, you made my day. It is such a pleasure to be able to help. These are the names I’ve given these places. I don’t know of anyone who’s explored here. Blindside Ridge. What an amazing place! Yesterday I set out to circle the entire Bradley Fork watershed. 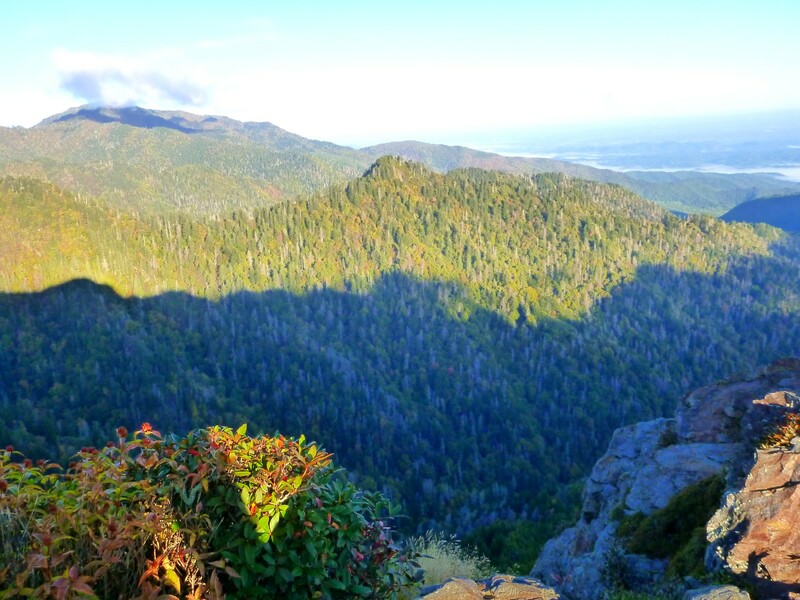 My goal: to see if I could get a good look at the ridges among the upper realms of the three major headwater streams: Chasm Prong, Frowning Rock Prong, and Gulf Prong. 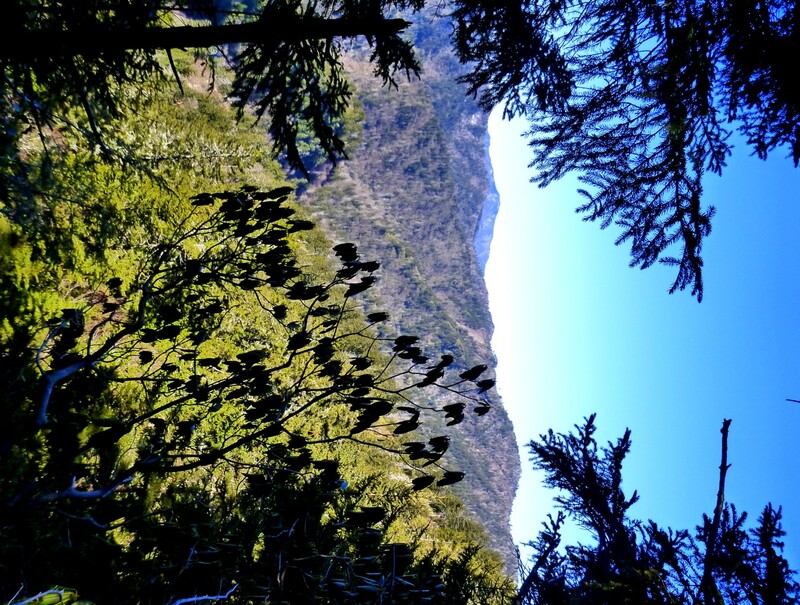 The hike’s dimensions were 24.6 miles and somewhere around 5,000 total vertical feet. (I’d estimated 4,400 beforehand but the cumulative gain function on my altimeter said 5,260 vertical feet. This route has a lot of small ups and downs.) 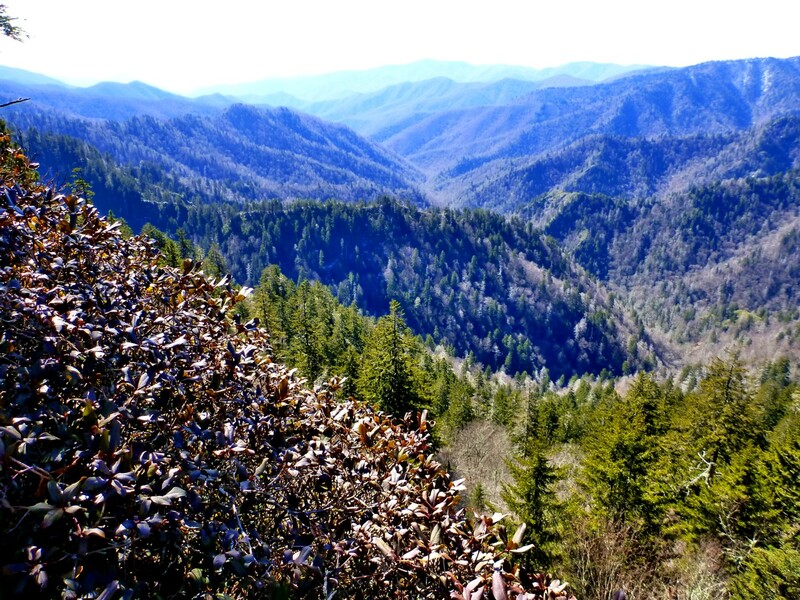 I started at Smokemont campground, took the Bradley Fork trail to Hughes Ridge to Pecks Corner, followed the A.T. across to what the Park calls the Dry Sluice Gap trail (former Richland Mountain trail), and down that to Bradley Fork to complete my circle. 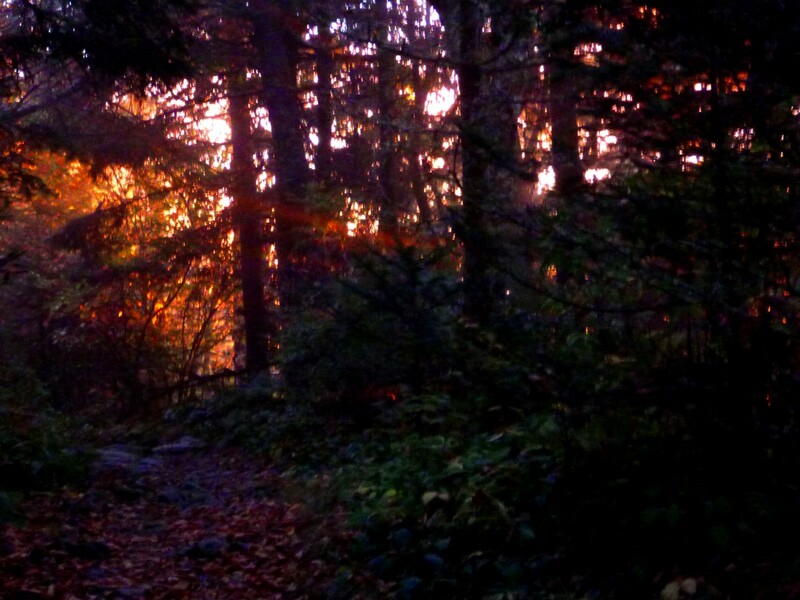 The light was dim when I started hiking at 6:30, but just light enough that I didn’t need to use my headlamp. Because access to most of the campground was gated off, I had to walk its length to get to the Bradley trailhead. 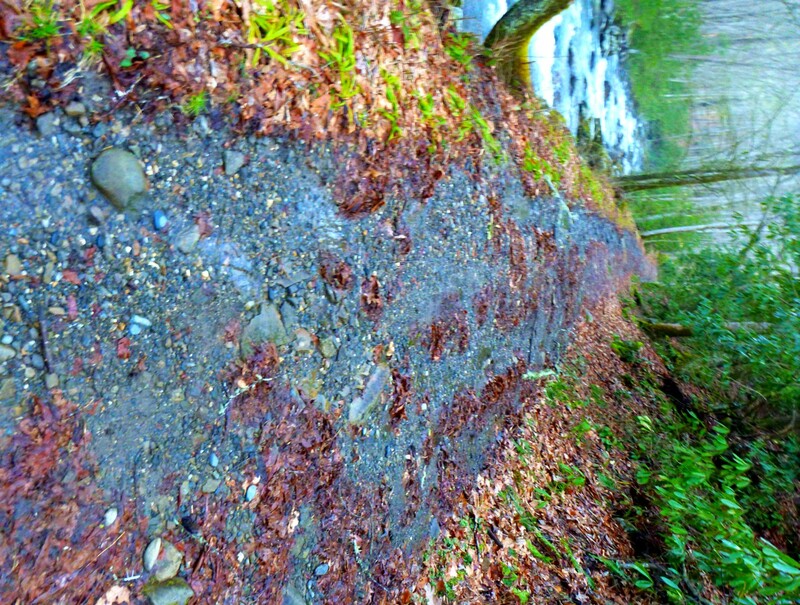 And once I reached the trail, there was no avoiding the tedium of its first four miles, as I slogged along a wide, flat gravel road beside the stream. 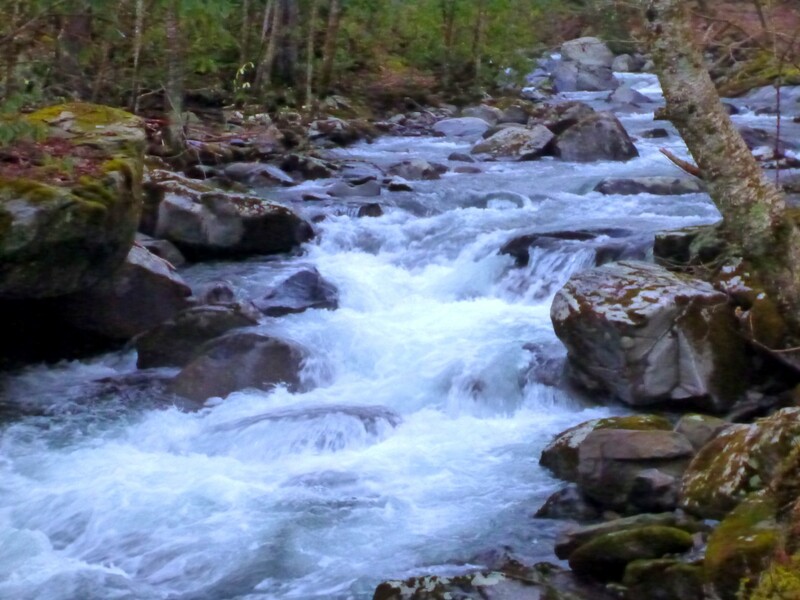 The saving grace is that most of the way I had views of one of the lovely big streams of the Smokies. Four miles of slogging. Ho, hum. But keep in mind that the long, tedious approach is part of why the upper part of the watershed is so wild. People don’t want to go through all that to get there. And apparently Champion Fibre didn’t get up into the headwaters back in the logging days, either. 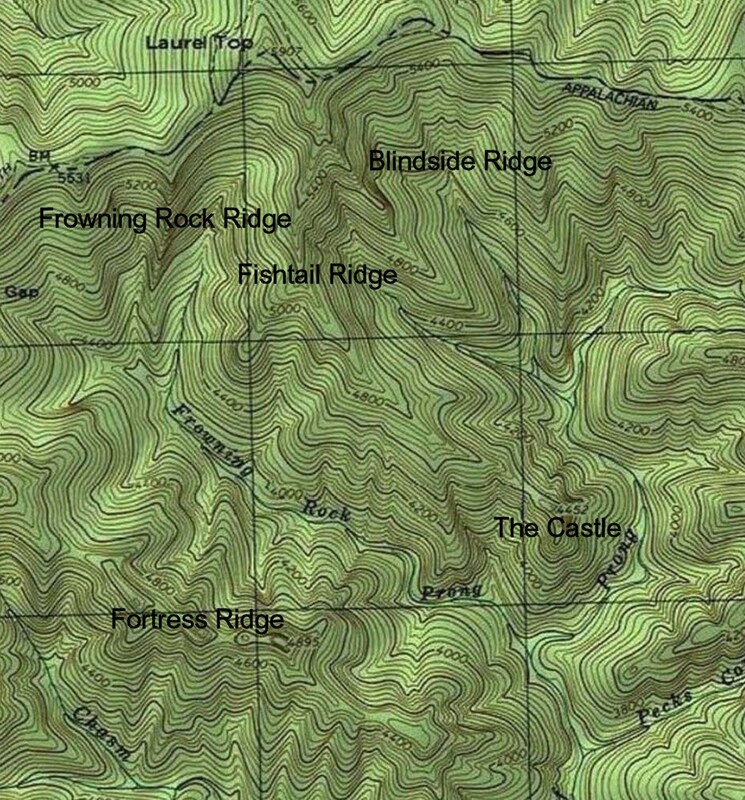 Maps of old-growth forest at the time of the Park’s creation indicate that logging did not take place above the confluence of Chasm and Gulf Prongs, below which is given the Bradley Fork name. In the lower area, of course, Champion had a gigantic timbering operation that fed its mill in Canton. 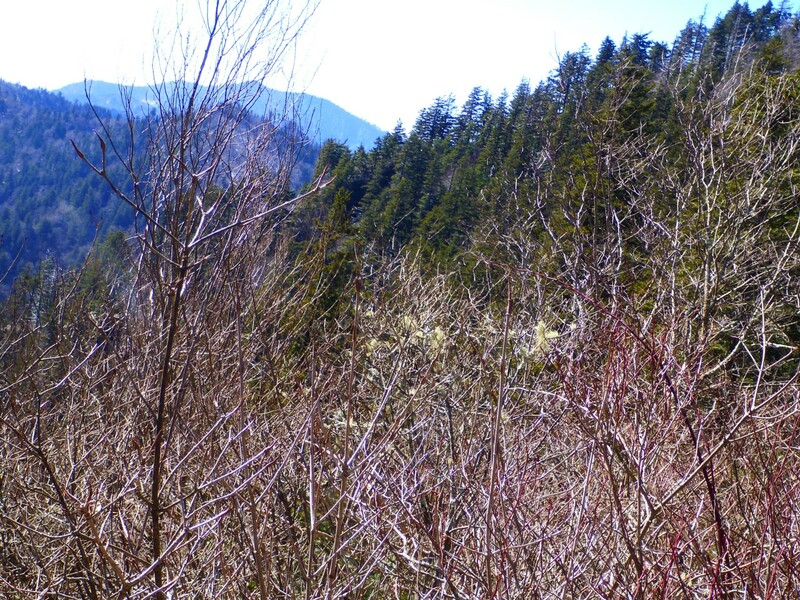 Even after the Bradley Fork trail leaves the lower valley to climb up to Hughes Ridge, it uses a wide logging grade that only narrows to a footpath about halfway up. Everywhere, I saw evidence of the January floods. 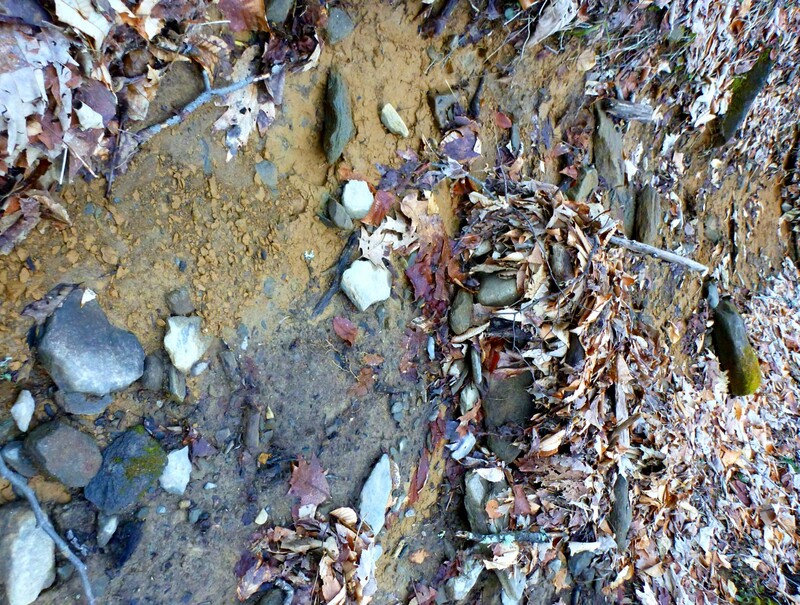 Water had scoured leaves, twigs, and topsoil from the trails, leaving rubble with debris piled up behind the stones. In places, the floods had deposited fine silt almost the consistency of quicksand, where a boot could sink in three or four inches deep. Once on Hughes Ridge, I had good views across the upper Enloe Creek valley to Katalska Ridge, which miraculously avoided the trailbuilding of its neighbors on either side, Hughes and Hyatt. It is covered with red spruce from top to bottom, and I would like to explore there. I began to encounter snow and ice. Pecks Corner looked wintry, and I put on my microspikes there for traction where snow packed down by footprints had turned icy. I kept the spikes on for eight miles. I ran into bare ground in sunny places, but the ice always returned. In most places things were crispy and crunchy—not much melting going on. 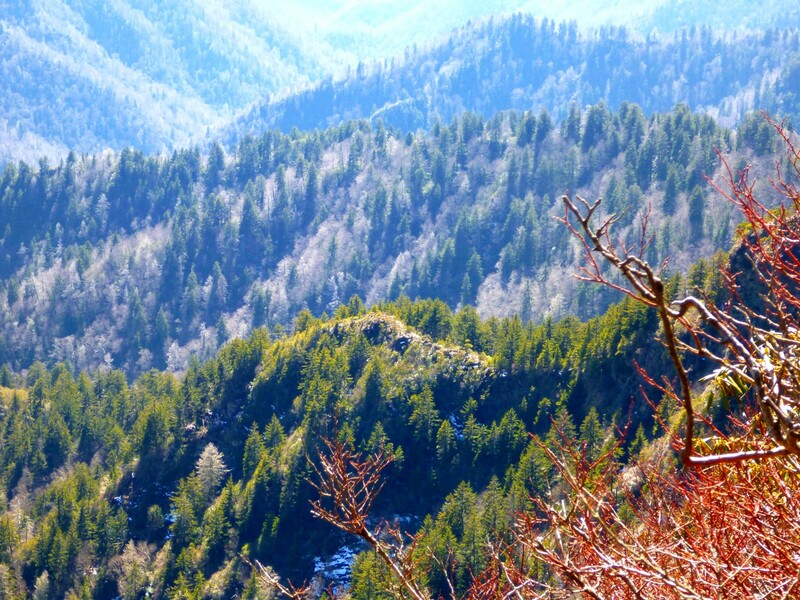 After I turned west on the A.T., I came to my first view of the upper ridges. 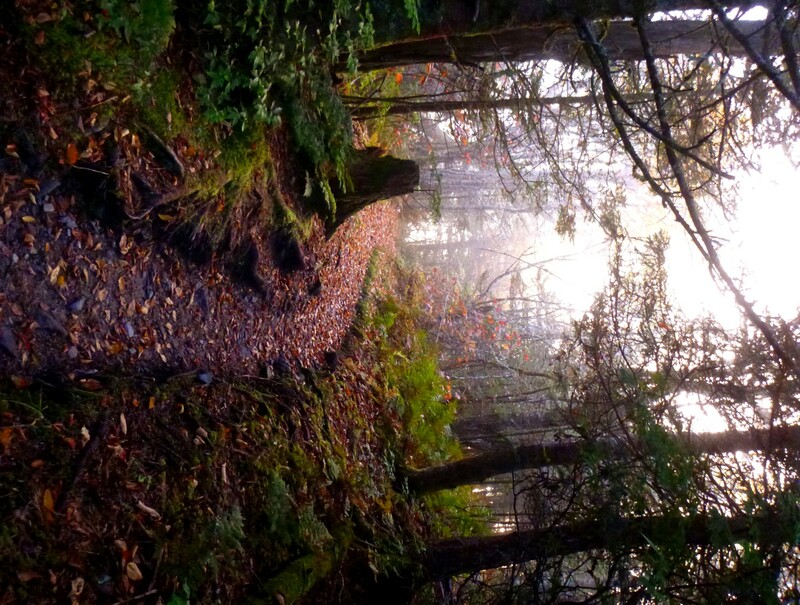 Although I had been on this trail section once before, it was on a rainy day with zero visibility. Therefore everything that I could see off to the sides was new to me. But I’d been looking at it on maps for a long time. Nice, but nothing too exciting until you start looking closer. 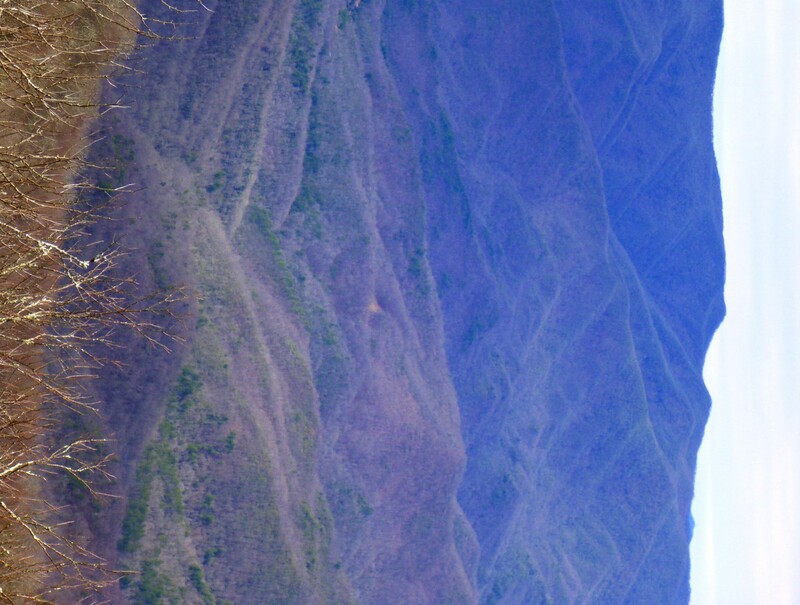 I could see landslides and rocky ridges. 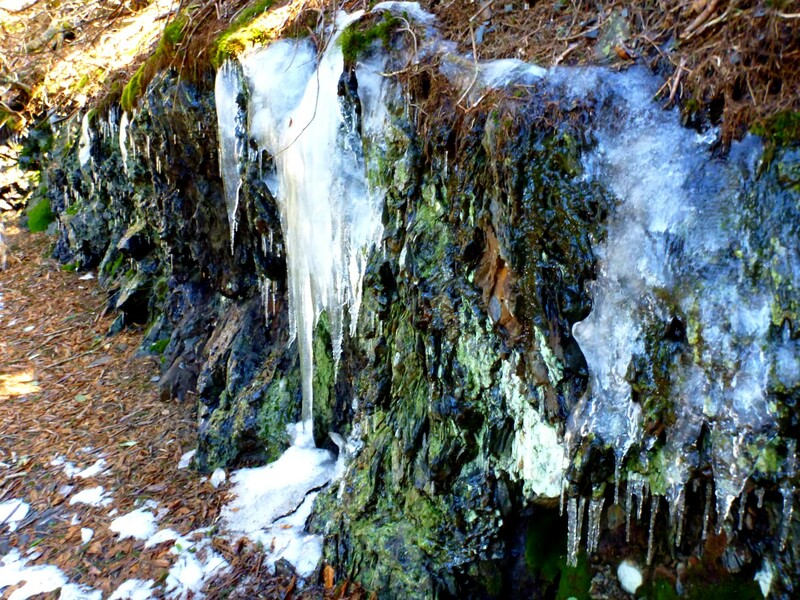 I continued along the trail, passing big icicles. I came to an old landslide. 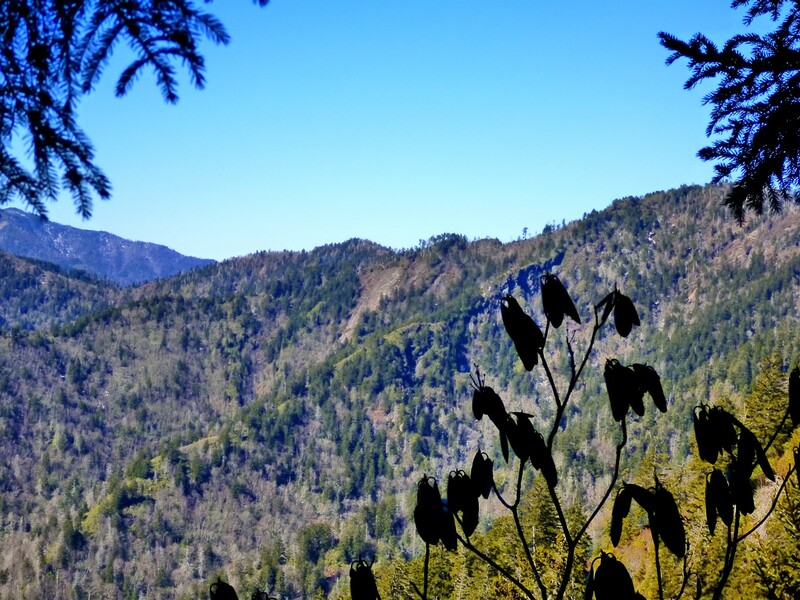 The Anakeesta rock and the whole aspect reminded me of slides on the Boulevard and Alum Cave trails on LeConte. Landslide on Gulf Prong headwaters. I soon came to Bradley’s View, which I’d been looking forward to. I spent a long time here, checking the features I saw against my map, using my compass to match things up. 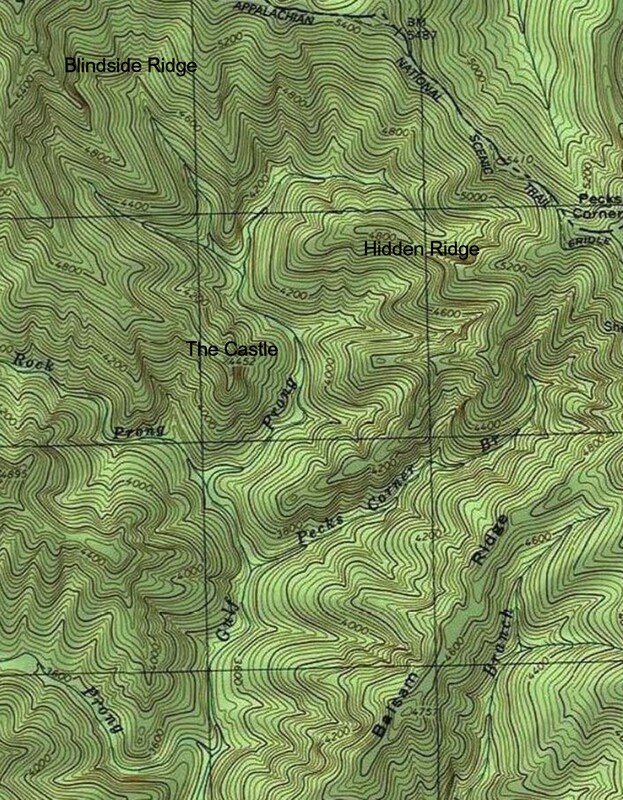 The hard part was that the map had no names that I could refer to for any of the ridges. So I gave them my own names. Looking straight down from Bradley’s View. Gulf Prong makes a great sweeping curve around a ridge, the top of which is rocky and impossible to see from most places. I called it Hidden Ridge. The reverse-question-mark shape of the stream reminds me of Raven Fork as it swoops around Breakneck Ridge. 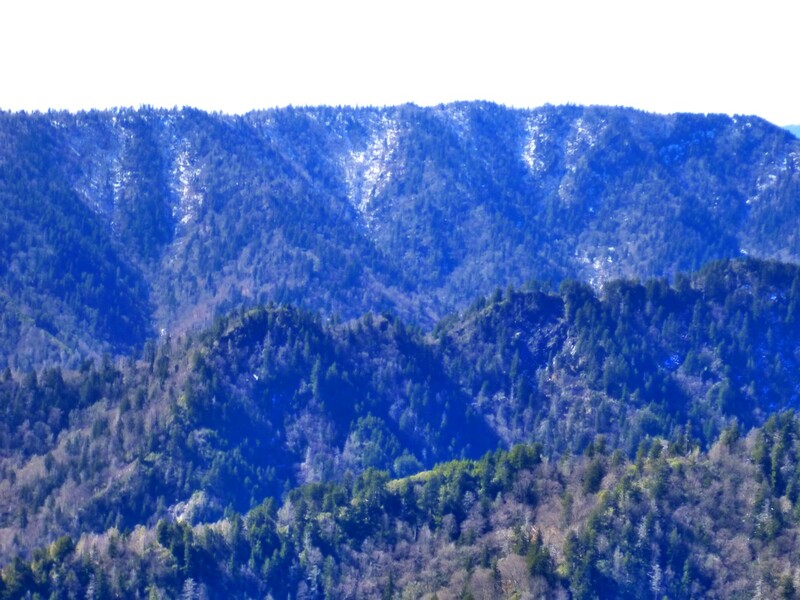 And certain patterns repeat in the ridges as well as the streams. Hidden Ridge: look at the narrow rocky spine that goes across, another ridge close behind it, Hughes Ridge in the background. The Castle is what I call the blocky heath-covered point that rises from Gulf Prong near the Frowning Rock junction. 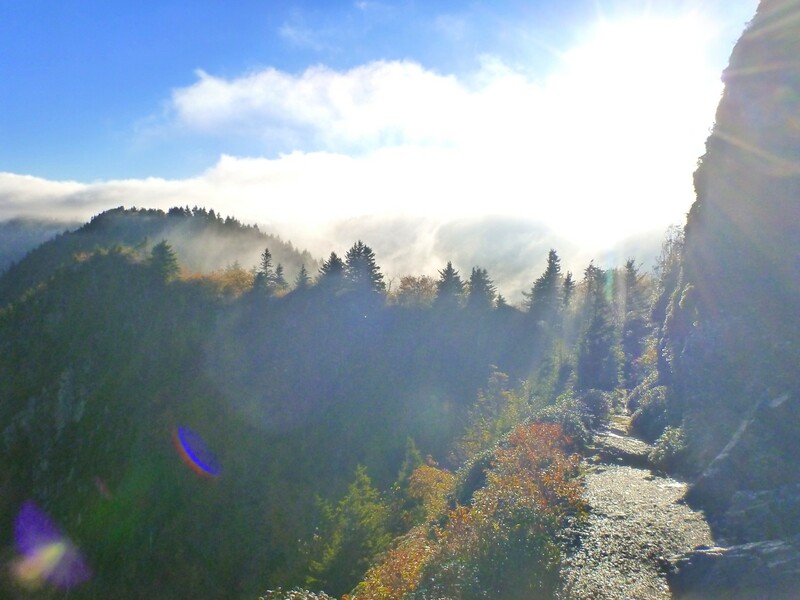 To the west, Fortress Ridge divides Chasm Prong and Frowning Rock Prong. Fortress Ridge is the long bumpy divide between Chasm and Frowning Rock, shown here below Richland Mountain. Blindside Ridge, Fishtail Ridge behind it. I called the second ridge over to the west Fishtail because of the way it terminates in two points. My view of it from this angle was partially obstructed, but the ridge beyond that—Frowning Rock Ridge—could not be seen at all. On the map at the top of this post, you’ll see its very strange-looking contours, coming to a pronounced spine with impressively vertical sides. 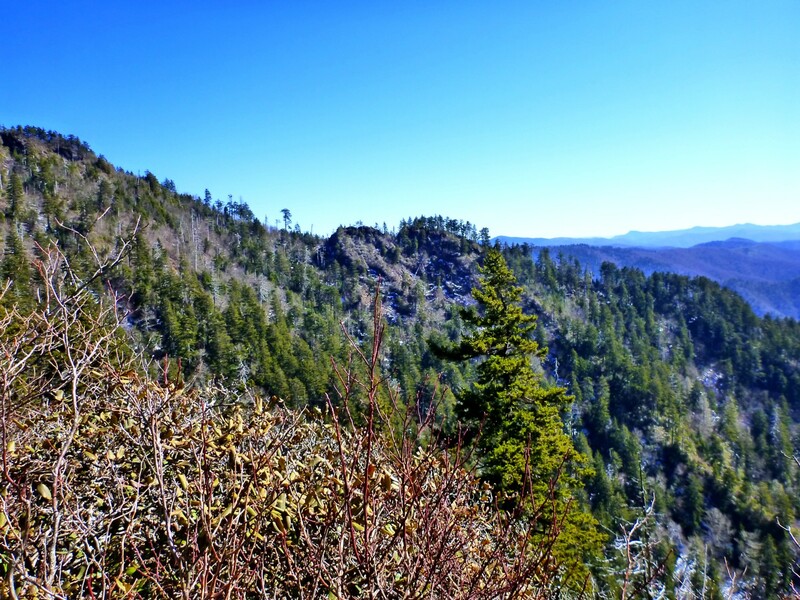 As it turned out, I could not get a good view of Frowning Rock Ridge from any point near the trail. It would have to be seen from Fishtail Ridge or Fortress Ridge. At last I left Bradley’s View and continued west. 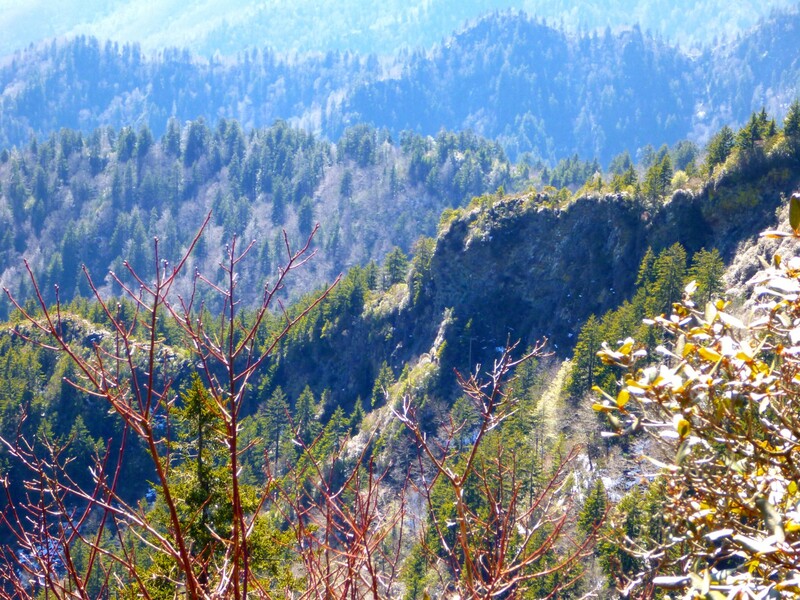 Looking back beyond Peck’s, I could see Eagle Rocks, which I hope to visit (via Eagle Rocks Prong) later this year. Telephoto view of Eagle Rocks. View down from close to Blindside – A.T. junction. I followed the A.T. where it wends around the north side of Laurel Top. The only other time I’ve been here was on the famous October 2009 backpack up and over Woolly Tops, when we ended up exiting the Eagle Rocks drainage to Laurel Top because of heavy rains. Junction of Laurel/Woolly ridge with A.T.
Before yesterday, I’d never been on the stretch of A.T. from Laurel Top west to Porters Gap. 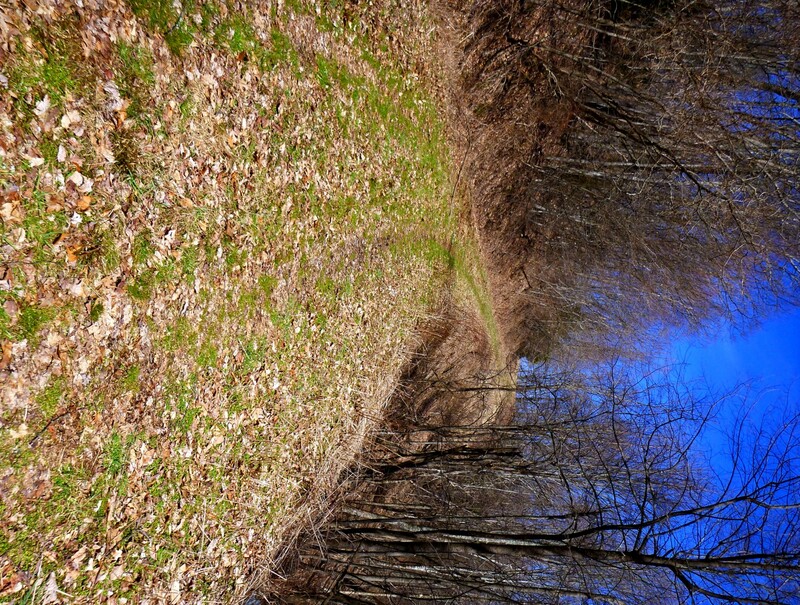 You might think that’s an odd gap in my trail experience—no side trails join the A.T. at those two points. Yes, those are the odd sorts of things that happen with bushwhackers. As I came around the west side of Laurel Top to join the main ridge again, I had a view of the upper west flank of Fishtail. I explored off the south side of the trail to see if I could get a good view of Frowning Rock Ridge, which joins the A.T. very close to this point. 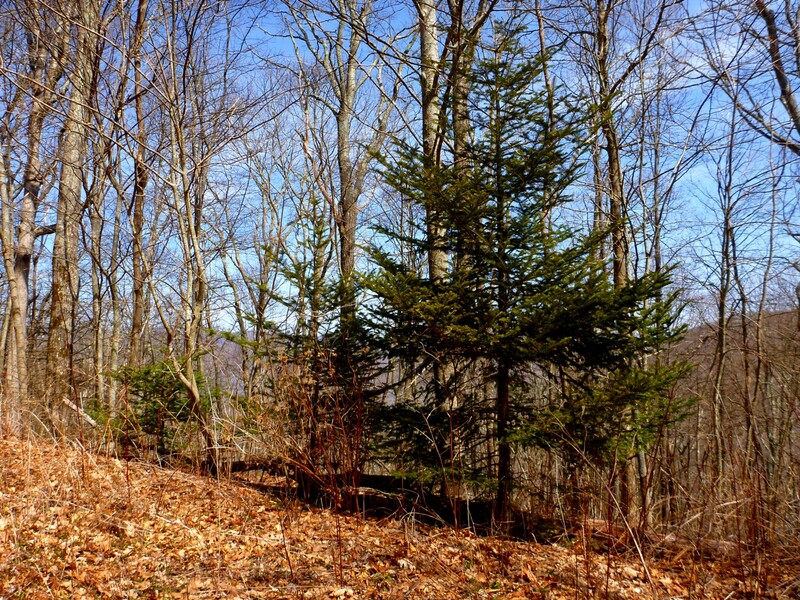 I could see the topmost spruce-covered portion but not the interesting portion of bare rock. 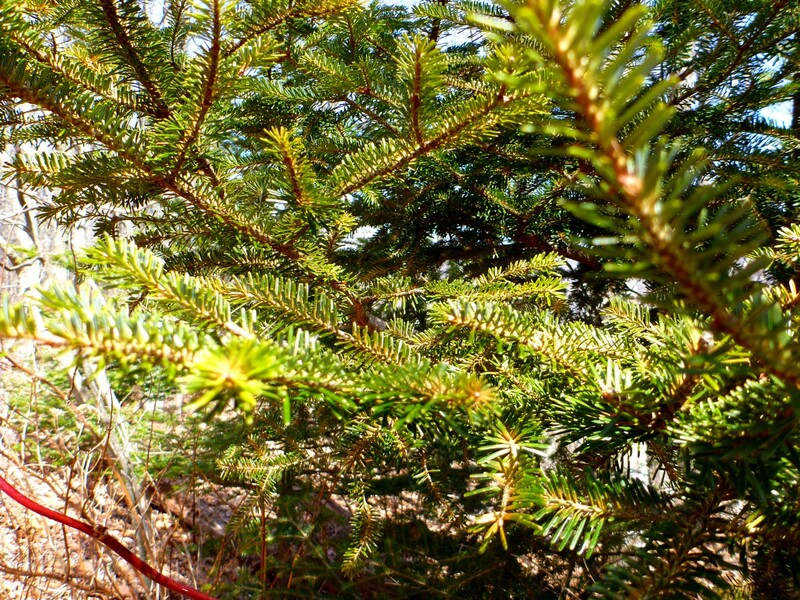 Spruce-covered top portion of Frowning Rock Ridge. 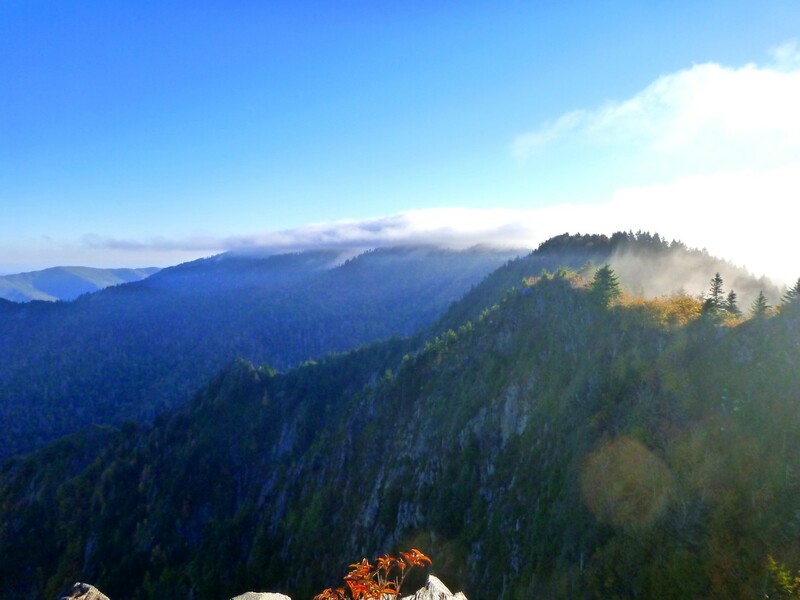 I’d hoped to do a downclimb of the ridge just far enough to reach the rocky section, but given the time, I decided this was too much to add on to my trail marathon. 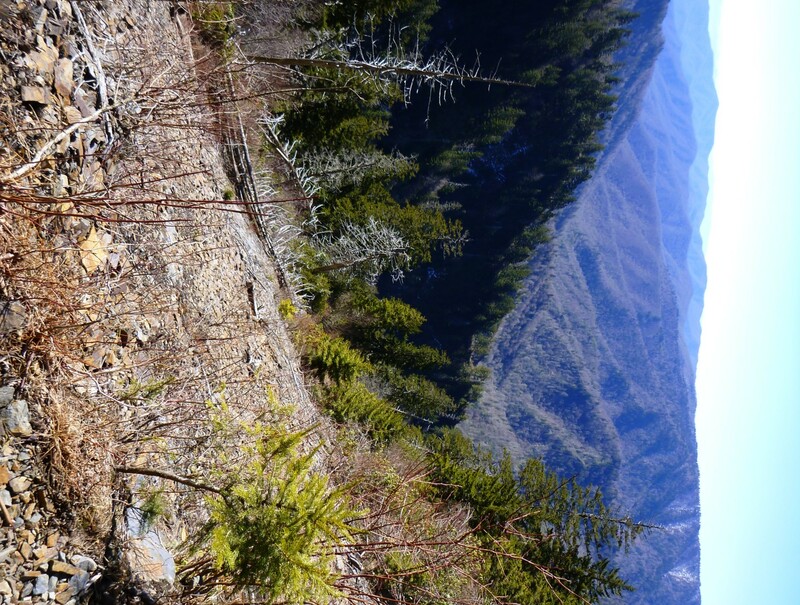 I continued along the A.T., passing False Gap and Porters Gap. 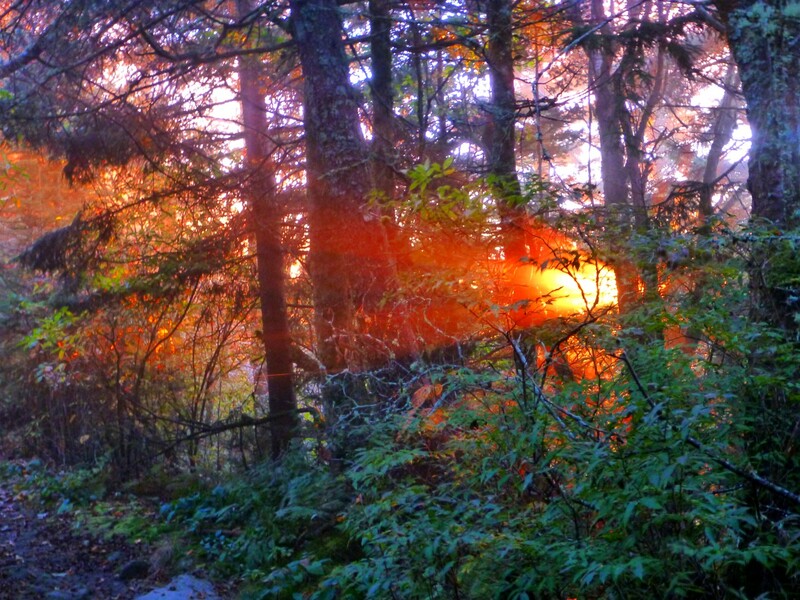 Along the way I met two separate thru-hikers (early birds! 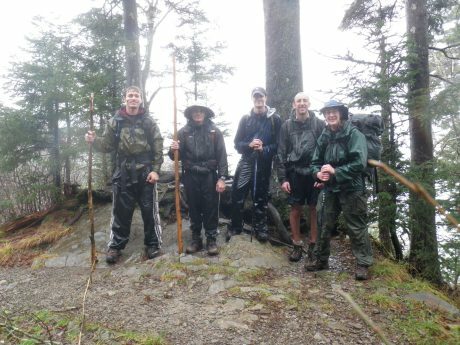 ), trail maintainer Pete Berntsen with the Smoky Mountains Hiking Club, out with his hand saw (dedicated! ), and two other guys backpacking. Glancing down the familiar top chute of Dry Sluice manway, I turned off on the Dry Sluice trail. I wonder if the Park calls it by that name so that people will stop talking about and using the manway of the same name? But I have to admit the former “Richland Mountain” name was confusing too, as the current trail leaves the old CCC Richland trail to drop into the Bradley valley along Tennessee Branch. I still had nine miles to go, and I officially entered Death March mode at this point, checking my watch, estimating my arrival time for each junction. When I reached Bradley Fork, I made an effort to admire the stream as I retraced those long four miles along it. And it was beautiful, but I was too glazed over to appreciate it. I’ve been talking to people over the past weeks about the Bradley Fork headwaters. It’s interesting that despite my picking the brains of various victims and reaching out to old-timer bushwacking types who’ve explored on the North Carolina side, I haven’t come up with a single person so far who’s journeyed up those streams, climbed up those ridges, ventured into that mysterious region. Let me know if you have.